I haven't played The Grizzled in awhile, but parts of what it expressed have lingered in my memory: a lot of desperation, a feeling of almost shell-shocked abstraction colliding with evocative trauma effects, the weight of words and their absence, and that so much depends upon a single cup of coffee. Drifting around these memories is the peculiar quality of the imagery on the cards, how everything was portrayed from the perspective of someone in a trench looking upward at floating symbols in the air. Even the peace and monument cards (good ending, bad ending) are composed from this same low angle, replacing the rubble of the trenches with barbed wire or wintering trees. It seems appropriate that these bookend images are the most stable, the conclusions once the waves of attacks, the gas, the shells, and the horror have settled. These contrast with the rest of the images which are perhaps the most "gamified" but also the most visually de-stabilized in the design, where the iconography hangs in the air in a way that is functional but also slightly unnerving and hallucinatory, unmoored, out of perspective. These are abstractions that work as game elements but hint at a scarier, more brutal metonymy that would give these objects a near talismanic quality to the soldier, as elemental as the sharp weather distinctions which are also codified in the game, sometimes even striped across the same card in a compression of time, spanning the same trench. It feels like a fevered mixture of images that are at once stark and readable, but also drift out of reference like a rotoscoped Linklater dream. The Grizzled adds another aspect to this design that makes this drifting and redoubling more potent: the imperative to be silent. Spoken language is taken out of the picture, adding difficulty to an otherwise more trivial (anti-)match-3 puzzle while evoking other intradiegetic silences that are kept in the interests of morale and maybe as an ultimate acceptance of the boundaries of the effable that are often tested in war. But I think the muting of players also leaves room for other things to happen. As players, we're presented with a reverberating tunnel of signs when we're silently gazing at these images. Gas mask. This is not a gas mask. It's a gas attack and all of the horror surrounding it, condensed into a sign that would carry meaning for the characters. It's not a gas attack, it's a matchable icon on cards which are played according to rules which can sometimes tell the story of these gas attacks, or just carry the connotation of them, or lend the player to more detached strategic considerations that have nothing to do with the idea of warfare or even a simulation of it. This isn't a representation of World War 1 but a furious shuffling and puzzling of its most vivid emblems in contemporary memory (from history classes or schoolbook poems like "Dulce Et Decorum Est"). Or, impossibly, it's all of these at once. And it can really only be all of these at once in the context of a board game, particularly one where spoken words are kept at the periphery, defining part of the game's puzzle and part of what it evokes. In doing this, the game invites a comparison to a similar experiment that was analyzed in a very meticulous, playful and punning series of essays by Michel Foucault in 1968 about Rene Magritte's work, This Is Not A Pipe. These short essays explored the effects of taking simple representational assumptions underlying words and images and teasing out their often contradictory contracts with one another, with the reader/viewer, and with the represented object. As I re-read these essays, I was struck by how familiar their ideas and conundrums were, and not just because I had read them before. They seemed to be describing gaps and representational ellipses in modeling that we've been bridging, often quite comfortably, in board games for a long time now. To me it appears that Magritte dissociated similitude from resemblance and brought the former into play against the latter. Resemblance has a "model," an original element that orders and hierarchizes the increasingly less faithful copies that can be struck from it. Resemblance presupposes a primary reference that prescribes and classes. The similar develops in series that have neither beginning nor end, that can be followed in one direction as easily as in another, that obey no hierarchy, but propagate themselves from small differences among small differences. Resemblance serves representation, which rules over it; similitude serves repetition, which ranges across it. Resemblance predicates itself upon a model it must return to and reveal; similitude circulates the simulacrum as an indefinite and reversible relation of the similar to the similar. This is a split that I notice in board games, but find all the more interesting because there isn't as much of a struggle between them or a need to bring one into play "against" the other. Similitude often plays with resemblance in board games. One is only given authority over another in more specific game subsets (abstracts for the former, simulation games for the latter). We can revel in the "analogness" of an analog game, all of the tangible bits, objects and definite rules that perform it, or we can enhance that reveling by occasionally anchoring the analogy in some of the events being portrayed, perhaps even by accident or emergence. But we don't feel the need to inhabit these events with constant fidelity. I think this is part of what distinguishes a board game from other collaborative representations (e.g. RPGs, theater, dance). Our appreciation and enjoyment can phase in and out of resemblance and occupy different registers of gaming (& similitude) simultaneously. The theme isn't necessarily the ground of a game, even in a more "thematic" genre. It circulates in and out of different pieces of the design and often doesn't seem to matter as much as the game's gestures toward it and our playful awareness of how we're enacting them. But we often get the sense that we are, in fact, playing a game "about" something, both in the sense of concerning and one of proximity, which is valued as a shared experience. So why is this important? Why do these fussy academic distinctions and their vicissitudes matter if something like a board game can usually bridge them? Because, in terms of representation & meaning, I think this reconciliation is actually unique and special to the hobby and opens up new ways of bringing our thought and its playfulness to bear upon lived experience. It restores something that I think Foucault lost from Magritte's less academic yet more poetic discourse about his understanding of the two concepts of resemblance and similitude. It seems to me that, for example, green peas have between them relations of similitude, at once visible (their color, form, size) and invisible (their nature, taste, weight). It is the same for the false and the real, etc. Things do not have resemblances, they do or do not have similitudes. Only thought resembles. It resembles by being what it sees, hears, or knows; it becomes what the world offers it. Foucault references this fan letter from Magritte in his essays and the full contents of the letter are appended at the end of most publications of This Is Not A Pipe, but the philosopher only picks up select ideas from Magritte's insight and sadly leaves this one on the cutting room floor. Only thought resembles. It becomes what the world offers it. I think that board games can demonstrate a unique mode of expression and play, where the meaning or significance of a subject can be obliquely arrived at and built upon outside of imperatives to simulate or even narrate that subject. They're a strange, liminal act of modeling that can bring about experiences valued on their own terms and in distinction from what they are trying to model, even going so far as to carry the thing being modeled into a new place or a new understanding. What makes The Grizzled all the more unique is that it brings these playful refractions to bear on a subject that doesn't seem quite as amenable to facile philosophical puns. This is war we're (not) talking about. It carries a debt. But perhaps as we approach the one hundredth year since the armistice, it's time to start exploring what seems to be the opposite side of the spectrum that games like Advanced Squad Leader have occupied, where resemblance and simulation is the assumed ground of the design. Wars signify in other registers than historically archived combat maneuvers; our thought can become/resemble them in different ways and not necessarily lose gravitas, but rather carry it into new contexts and a more personal, human understanding. That of which we cannot speak can in fact be passed over in something other than silence. Games offer us another path. * this is incidentally an annoying mistranslation of Les Mots et Les Choses which in fact means "Words and Things"
Castles in contemporary culture are almost invariably associated with a certain skew towards the less than sane. They occupy a strange corner in our architectural imagination, somewhere between Arthurian nostalgia for the medieval and the dark whimsy of old fairy tales. They almost construct themselves in our mind’s eye the moment we think of them, setting a mood and sense of place that induces us to fortify against some imaginary onslaught and expand inward, room by room, at our luxury. 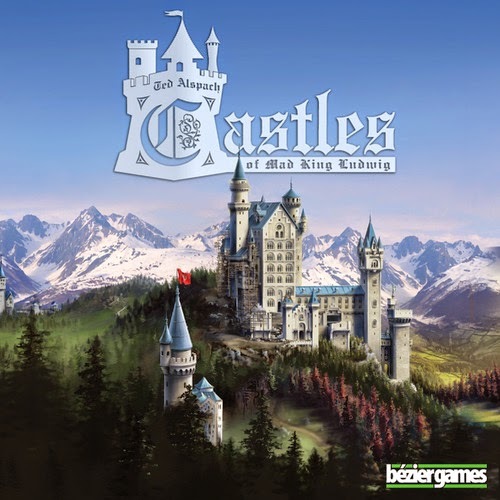 Castles of Mad King Ludwig attempts to tap into this allure in an obtuse way by revisiting an earlier design, Suburbia, which garnered much of its success by interpreting core aspects of Sim City into a board game. Castles leverages the urban expansion engine of its predecessor while cutting back on some of its complexity and depth in favor of its most approachable aspect: tile placement. While players of Suburbia enact a sedately planned suburban sprawl through zoning for victory point synergies and carefully balancing growth and economy, they occupy a simpler, more improvisational role in Castles of Mad King Ludwig. In each round, players expand their individual castle with a single room or enclosure tile. These are selected from a set of rooms of different shapes and sizes that are put up for sale on a “contract board” comprised of five to seven different price slots. Each of these rooms provides meager points unto itself but connects to several other point systems which can shift from turn to turn. These include adjacency bonuses/penalties, secret individual goals (e.g. have the most square footage of sleeping spaces), randomly selected achievement bonuses or “favors” for each game, and “completion rewards” for connecting all doorways in a room. These rewards in particular can be quite powerful as they allow players to bend the game rules (e.g. manipulate the next set of rooms for sale, or take an extra turn) or get substantial boosts in VP or income. Placing a room instantly awards points from these systems, often chains of them, which can feel like the satisfying leaps of bonus points in a pinball machine. This appeal lends itself to some unconventional room placements which are right in line with the “mad king” spirit of the game. But each of these rooms, each of these triggers for the player’s elaborately planned cascade of points, has a monetary price. So how is this price set, and how do players make their money? These are both addressed by the clever use of the old technique of “I cut, you choose,” which brings an element of interaction between the players. Each round begins by passing the role of “master builder” to the next player who replenishes the rooms on offer and assigns them to different price tiers on the market. Everyone’s payments go to the master builder for the turn but with a catch: the master builder is the last to select a room. This puts the master builder in a precarious position, balancing the affordability of these rooms to meet conflicting goals. She would prefer her room of choice to remain unselected without pricing herself out of buying it. However, this requires monitoring what opponents might want in order to ensure at least a couple of purchases, without also awarding rooms that would give opponents too much of an advantage. This aspect of the game may set off analysis paralysis alarms until players are reminded that some of the bumpers in the pinball machine are in fact invisible: everyone has hidden objectives that can derail the best laid passive aggressive plans. Nonetheless, this can be a jarring element in the tempo of the game, giving careful pause between bouts of crazy room placements. Perhaps this is another echo of the madness of the king, alternating between shrewd manipulation of the labor market and the reckless joy of laying out elaborate room plans to suit his whimsy. While this particular contrast works for the most part, there are a few less intentional, and less successful, inconsistencies in the design. After completing the first few games it occurred to me that the art on the box cover is an order of magnitude more evocative than the game itself. This isn’t unusual in board games, but it made me realize that this discrepancy didn’t exist with its predecessor Suburbia, underscoring some aesthetic issues in this game that may disappoint some players. Suburbia’s intentionally sterile visual style had a businesslike “urban idyllic” quality befitting the subject of suburban planning and lending itself to the readability of the game. But it seems as if this same style choice was ported more or less unquestioningly to Castles without enough consideration for the smaller, closer scale of the game, or for the opportunity to convey a unique sense of place and theme that should be felt by the player when building a castle rather than a suburb. Looking at a tile layout in Castles of Mad King Ludwig often feels more like staring at the dull architectural schematics for a mansion. The tile art is devoid of inhabitants, though their furniture and other belongings are meticulously composed in a perfect overhead angle, making visual details rather geometric and abstracted. There are a few props here and there to justify the name of a room: some pots (grey circles) on a counter (brown rectangle) in the food prep room, some manacles in the oubliette (line drawing of handcuffs in a black circle). But few tiles, with the exception of some of the larger ones, carry a sense of place or uniqueness beyond their iconography and color-coded floors. This seems like a lost opportunity to have more fun with the art and visually convey the game’s implied whimsy instead of relying on room labels and the willingness of the player to fill in the oddly missing atmosphere. The style of the iconography, while very readable, is also discrepant with a medieval setting, feeling more consistent with airport or road signage. This would be less noticeable if it didn’t often dominate the artwork on the tiles -- especially the smaller ones -- with a layout that can also be difficult to parse for a newcomer. Room types are indicated by a miniscule icon on the bottom left while the adjacency bonuses are front and center and much larger, which can lead to confusion while learning the game unless players are told that room types are also color-coded. The overall effect can lead players to stare at a puzzle of stylistically neutral icons and numbers instead of the bizarre castle underneath. While the player’s castles have an element of (pastel) color-coding, the scoreboard and central board, which take up a comparatively large area on the game table, are entirely grey with an antiseptic cobblestone pattern; no shading, no signs of wear, no ivy, no castle madness. This scheme recurs on the inverse side of most of the game’s cards and all of its tiles, all of which are initially stacked on the same central mat. This creates a depressingly large swath of flat grey in the game, a color that, while certainly a dominant element in real castles, becomes abstracted and simplified to a dull, lazy visual shorthand. These aesthetic hangups may seem petty but they can create a cumulative sense of disconnection that drains just enough fun and atmosphere out of the game to become irksome. It betrays a subtle, maddening cluelessness about the appeal of castle-building, never quite bridging a schizophrenic gap between some of the game's most satisfying mechanisms and its purported theme. This creates the impression that it tried to recapture lightning in a bottle without completely understanding the thematic coherence which allowed that original success, a King Midas groping at game elements and coming back with dull architectural drafts instead of gold. Some players will be predisposed to enjoy the feeling of building a castle and will look through the strangely utilitarian art, the airport signage, and the muted color palette and invest some imagination into their crazy constructions. Those less inclined to do this may still greatly enjoy the compulsion of maximizing their point bonuses and achievements or the perpetual “I cut, you choose” puzzle that occurs throughout the game. If neither of these aspects appeal, you probably won’t find any further hooks into the game and will instead relegate Castles to an appropriately grey area in your collection: the “solidly decent” shelf, a dungeon the game could have easily escaped by indulging in just a little more of the madness of its own subject matter. Shadows of Malice effects a bold and evocative fantasy adventure framework, showing design choices that I (perhaps vainly) hope will be carried forward in future games in this genre. It has some lessons to teach which deserve attention in the growing representational fantasy juggernaut of giant miniatures, overwrought lore & event text, license tie-ins, and exclusive Kickstarter content franchises. The nuts and bolts of this system don't seem revelatory at first glance, albeit refreshingly straightforward. It provides a versatile d6-based roll modification system (using some satisfyingly chunky and colorful acrylic "crystals" to trade, expend, and harvest) for chance-driven elements ranging from movement and combat results to skill procs, in combination with some card draws for battle loot and other item acquisitions and the occasional effects of "fate". All of this is draped with just enough narrative cohesion onto an archetypal struggle of light versus dark beings which carries a few, thankfully subdued elements of game lore. After the first few beats of the game, though, it becomes clear that there's a refreshing efficiency to this framework, combined with a respectful amount of restraint and remove; a lack of contrivance where it was apparently never needed. This noticeably cuts through a rule fog that tends to creep between the player and the game world in more baroque designs such as Mage Knight, while the thematic openness allows the player to more fully invest themselves in the game and inhabit the experience rather than spectate fantasy cliches. The culminating feel can be summed up as less filler, more space. This certainly feels revelatory in a fantasy adventure board game: that the player can be trusted to take their cues and build an experience, rather than flipping a card, reading some mandated text illustrated with cliche van art, and shoving a Cthulhu or Star Wars model around a map. 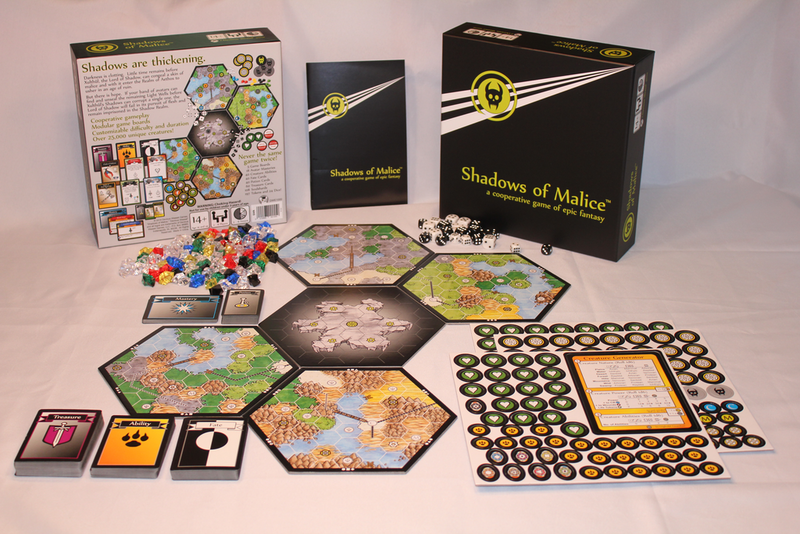 The game certainly provides props toward the experience, but these are more considered and less obtrusive: from the clean, minimal box cover, to the maps which take cues from the front or back pages of old fantasy novels, the clean symbology, and the crystals that refract the light on your game table and tie into the theme of the game in such a simple but aesthetically effective way. For me, the way in which Shadows of Malice distinguishes itself shows an element of maturity and confidence that I don't often encounter in this genre. It respectfully leaves the staging of its narrative and actors -- as well as their visual illustrations -- to the player's own imagination, which makes for a much more immersive and personally fulfilling experience. The monster generation system is a prominent example of this design choice, where the player rolls to determine monster type (partly based on terrain), combat power, and special abilities. The image of the creature thus created is left entirely to the player's imagination, which can be fascinating and memorably bizarre, provided that you refrain from falling back on your own tired Tolkien visual tropes. This is one of the few games where encountering a dragon or a Nazgul oddly feels disappointing because it seems like the result of a failure of your own imagination. There are much more interesting battles to be fought here. I risk overstating the openness of this system, however. There is definitely a designated flow and goal to the game. This isn't a sandbox or a mere collection of tools for a fantasy crawl. The rules are clear, and the goal of your avatars is always to gain the strength they need to unlock certain locations, Light Wells, while the strength and number of shadow beings grows through a quasi-AI system to seek out these wells and trigger their own end game: the ultimate incarnation of a dark being named Xulthul. If you are beaten to the punch, you're in for a difficult battle, fueled by tough odds and a hopefully grandiose imagination to match. The heavily luck-based systems may become off-putting for some who would perhaps rather fall back on more stable, incremental, deck building systems or rules puzzles to allow them to hone and craft the most efficient series of actions for their turns. There can be some measure of satisfaction and control gained from this, but at a cost that Shadows of Malice doesn't really care to pay. The filter between player and game world would become less raw and immediate, the "gameable" elements becoming a means detached from the ends, something this spectrum of board games has always struggled with. I don't believe this game is designed with that mindset. Instead, it targets those who can comfortably bridge the managed chaos of the dice with the significance of unfolding events in the game world. It's a weird, liminal form of roleplaying and fatalism that should be familiar to a distinct audience. For anyone who remembers those harrowing encounters in D&D, where you feel like you're throwing every possible roll modification at a fight to surmount an increasingly desperate, evil dice-fest that seems to be driven by some sort of dark magic against your favor... and finally pulling through, limping away hemorrhaging with every status effect you can think of, understanding that your struggle with the dice was modeling a ridiculous bloodbath of a battle (or a comedy of errors), welcome back. It's good to be home, isn't it? In all of these respects, Shadows of Malice exemplifies how to do fantasy better in board games. It understands and respects the heart of the genre and gives us some wonderful adventures in the process. What more can we ask for? Note: This is a revised version of a review that I originally posted on boardgamegeek. I've since been recruited by gamingtrend to publish reviews for them. As such, future posts on this blog will consist of personal gaming updates, general musings, and will include links to full reviews on gamingtrend. "Centuries of their labor would not reveal to them any more of Creation than they already knew. Yet through their endeavor, men would glimpse the unimaginable artistry of Yahweh's work, in seeing how ingeniously the world had been constructed. By this construction, Yahweh's work was indicated, and Yahweh's work was concealed." Tower of Babylon, Ted Chiang. Ruthless, hermetic closure in a narrative space holds an immediate allure for the reader. Hours of guided "close reading" in literature classes (often under the tutelage of very old New Criticism practices) have ingrained an ongoing cultural belief that self-referentiality and resonance within a work are true signs of artistry. Engaging with this type of closure, whether to appreciate or criticize a work, can often elicit a critical language that mimics its subject and I immediately fell into this trap with Bioshock Infinite as I started to formulate my litany of grievances with the game. I lost myself in the exercise. Much like the chair that I "willingly" strapped myself/Booker into as transportation, it predictably closed like a trap, carrying me along with a momentum that shifted my perspective from elation to something close to sickness. Elevators, zeppelins, or rails transported me to spectacles as carefully staged for surrender and awe as a cathedral under stained glass. Or a theme park. Like many players in the initial hour of the game, I absolutely surrendered. Baptized and ushered into a beautifully rendered city in the sky, I wandered through the first areas in a daze, absorbing every detail, every vista, every conversation. It was like listening to the opening of a sermon and running into Disneyland at the same time but this quickly began to exhaust itself. Or rather the sermon began to propagate into every corner of the experience, drowning it in caricature and bombast. The presentation of the environments became as didactic as the in-game propaganda, giving me a constant pairing of dramatic scenery with religious or racist conversations, placards, portraits, slogans, lest I forget that this was a society of xenophobic sheep. It was so oppressive and ubiquitous that I couldn't open myself to what I was directed to feel as I was relentlessly funneled along to the next attraction: nostalgia, awe, outrage, revulsion. All of these seemed over-represented and under-developed, like placeholders, pointers for the next series of events that would justify the gun I constantly held in front of my face. The lines between the game’s different forms of didacticism started to blur uncomfortably. An elevator sermonized me with absurdly bespoke, interstitial captions wrought into the iron beams between floors, presenting me with what amounted to a silent movie montage as my view panned down through significant scenes of toil on each floor. Who was the ideologue here? The preacher in the game or the one behind the game who choreographed a slideshow in an elevator with such self-assurance in my suspension of disbelief? As I encountered the museum set-pieces in the Hall of Heroes I began to realize that these exhibits and my passage through them were microcosms for most of the dynamics in the game: wander through sequences of propaganda submitted to my superior judgement and Booker’s tired amnesiac duplicity, admire the dramatic lighting, the exaggerated architecture, the operatic music, smirk at the figures and mobs popping into view, listen to a disembodied villain barking over the PA system, accept the eventual wave of targets that I could mow down like ducks Vox Populi in a shooting gallery. My only forms of agency outside of this template seemed to be resource gathering to keep my meters topped off and my abilities updated, and an occasional decision that curiously didn’t branch to anything. I was sometimes offered pauses, moments where a choice presented itself between standing around and doing nothing or submitting to an event by pressing a button. It was supposed to feel like stumbling into the intractable "would you kindly?" moment but became less affecting for the repetition. I need to pause again. I can feel my criticism getting carried along the game’s implosive momentum, its irresistible urge to make everything a reference to some other aspect of itself. I get a sense of satisfaction out of doing this but I think the writers of Infinite fell under this same lure. When one’s language and figures start to resonate among themselves, it feels tempting and obligatory to follow their inward momentum as implicitly significant, something that will almost magically mean something to perceptive readers through the combined weight of their thematic material and self-reflection. Without moderation and a critical, nuanced effort to tie the work back to the world the result becomes inscrutable, closed to any real dialog or reading beyond a dutiful interpretation of its own internally significant figures. Bioshock Infinite obstinately stares into this mirror and never really returns to anything outwardly significant. I could feel the maw closing at a certain turn in the game’s story. A proletarian uprising gave me one last possible reference to something outside of Booker DeWitt’s tortured psyche. “It’ll be like Les Miserables!” exclaimed Elizabeth, at which point I should have heard the cynicism approaching but I tried to ignore it. I briefly felt some sense of historical resonance and subversive short-circuiting that wasn’t just a caricature from a theme park. A kid was singing “Fortunate Son” in blues a capella. Irish war songs jumped out of the indistinct roar of the angry mob. It felt exaggerated but energizing and purposeful, like a living Eric Drooker poster. But this significance quickly self-destructed under the overarching obsession with the zero-sum game, the perfect, closed system: the violent revolution became framed as just another form of futile idealism and hunger for power, the other side of the same coin. Daisy Fitzroy, the leader of the rebellion, went power-mad and began barking at me over those same villainous PA systems, telling me that I “complicated the narrative.” This sounded strained in its anachronism, as if her language was suddenly putting on a new costume and wasn’t comfortable with the wardrobe. She figuratively twirled her mustache while holding a child hostage, ready to kill in the name of idealism at any moment. This particular museum exhibit didn’t end with my actions, however. Through a pane of glass, I watched passively as my verbs become Elizabeth’s verbs and she executed Daisy with a pair of scissors. We moved on to another inter-dimensional tear and the game continued to distill itself into self-referential oblivion. I wish I could say that Bioshock Infinite is a missed opportunity, but this would imply a lack of intent on the part of the game’s creators. They foreclosed on most opportunities to use their thematic premise with any kind of bravery, honesty, or outward relevance because they explicitly chose to reduce it to yet another first person shooter meditation on self-redemption. Though it may be wrapped in the entertaining science fiction conceits of quantum loops and steeped in a self-conscious iconography of McKinley-era Americana, this is in fact the path of least complexity, least offense, least risk. One can make it all about a few regretful personal choices that can’t be taken back and wrap everything up neatly with a decision that erases everything. In doing so, any gestures toward historical awareness, racial politics, or self-consciousness about the repercussions of violence become placeholders that point to nothing and ask nothing of the player. The end result is very digestible and briefly poignant, but ultimately obtuse and evasive, artful without art. As I completed the game, I wasn't sure what to do with the experience it had given me. It was like walking away from an evening at a theme park that somehow tried to tell me the story of its own significance at every kiosk and turnstile then faded to nothingness as I left the lot. It was haunting, but not in a way that stayed with me, not in a way that asked me to return. I feared that if I turned around for another glimpse, I would just be watching the slow heat death of the first person shooter.